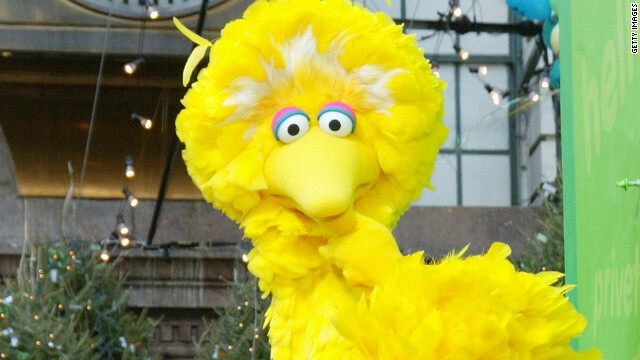 Fact check: Will Romney send Big Bird to the unemployment line? Mitt Romney said that he loves Big Bird but that the "Sesame Street" resident is not important enough for America to go into debt with China to subsidize him and his PBS friends. Does this mean our feathered friend could lose his job under a Romney administration? Would he then become a drain on our society? Are there retraining opportunities to become a St. Louis Cardinal or Baltimore Oriole? What family does Big Bird have? Who the heck is this yellow thing? How likely is it that Big Bird gets the pink slip? Our yellow feathered friend may be hoping he'll be able to mind his Ps and Qs on "Sesame Street" but might be feeling a little worried about his bills while the cloud of losing his job hangs over his head. How likely is it? Sesame Workshop, which produces "Sesame Street," says on its website that 93% of production costs for the show are covered by licensing activities or corporate sponsorships, CNNMoney.com reports. But Children's Television Workshop, which helps produce "Sesame Street," gets a decent number of grants from the Corporation for Public Broadcasting. Here are the numbers for those ready to count with the Count: In 2009, it received $2.5 million in total. In 2010, a federal Ready to Learn grant, which helps put on educational TV shows, provided about $1.5 million, and the overall digital presence for "Sesame Street" and friends got $8 million to help spread educational messages and games online in 2011. So maybe Big Bird should be taking this seriously. Even if most of the funding goes to his friends, a change in funding might put them out of work too if Romney were to go through with his idea to cut subsides to PBS. And that doesn't sound like it'd help all the people in his neighborhood. It isn't the first time Big Bird has found himself in the middle of a national budget debate. Last year, he survived a brush with budget-cut-hungry Republicans in the House, who voted to slash funding for the Corporation for Public Broadcasting, only to see it added back into the final government funding deal. What happens to Big Bird's health insurance if he gets axed? If our "Sesame Street" friend did join the 12.5 million Americans who are unemployed, his joyful tone may switch to a sad rendition of "Can you tell me how to get to the unemployment line?" On the upside, Big Bird still has plenty of time ahead of him – well, depending on which “official record” you use. His boss swears he’s 6 years old, but we’re a little wary. That bird has been flocking around TV for ages, 40 years to be exact. And unless he’s a Benjamin Button bird, he’s got a lot of explaining to do. It seems like we may need to stop and ask Mr. Bird for his official paperwork. But that’s a different debate. For now, we’ll take the bird at his word. At 6 years old, he'll have some time to refocus and perhaps try to get an education to bolster his options when he looks for work again. After all, we know Big Bird is good with children, so surely he can handle some rowdy sports fans, right? Who’s to say he can’t get a degree and find a new home away from Sesame Street, and if he doesn’t have to deal with mountains of school debt, he should be able to afford to move to, say, Baltimore or St. Louis to help rally fans around the Orioles or Cardinals. And while health care may always be an issue (hey, you never know about avian flu), the good news is, he has plenty of time to wait and see whether he'll have to be worried about Medicare down the line. Would Big Bird outsource himself instead? Sometimes you can debate whether tax breaks for going overseas are good. But for Big Bird, the temptation might be there, if nothing else than to frustrate Romney after his dig. Big Bird, whose "Sesame Street" owners said he went to sleep early Wednesday night and wondered whether he'd "missed anything last night,” may even be on the phone right now with his cousin Da Niao in China. Romney said he'd want to cut subsidies to PBS because he's "not going to keep on spending money on things to borrow money from China to pay for it." That may have been a big blow to the yellow feathered friend, because Big Bird shares a special love for China. Big Bird went to China after he was inspired by a scroll in Chinatown in the first international special based on "Sesame Street." Besides being fascinated by the culture, he thought it'd be great for the two countries to have a good working relationship; there's so much they could learn from each other. "Everyone in America wants to know about China, right? What a great thing it would be if a great big American bird went to meet the beautiful Chinese bird," Big Bird said. "I mean, she could tell me everything about China, and I could come home and tell everyone here." Let’s hope his date isn’t a Peking duck. Then his goose would be cooked. So that was a bit of fun. Here’s how the real CNN Fact Check Team broke down Wednesday’s debate and the rest of Campaign 2012. And comedian Dean Obeidallah has fond memories of Big Bird and hopes he will get a reprieve. Children Television workshop is worth $356-million, much more than Romney and only get 6 million from the government. They do not need any taxpayer funding. if sold to Viacom or Disney they easy can be worth a billion price tag. Last time I checked Dora the Explorer does not receive government funding and sees doing just fine. In addition Doctor Who, a one time staple of PBS fund drives is enjoying exceptional success in the private sector. It make as much sense to fund PBS as a Wall Street firm. Now as for the Healthcare angle this is a pure red herring fallacy, a vain attempt sidetrack the argument . Who brought up big Bird, Romney, who is sidetracking?